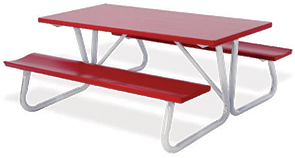 From its easy access slide through design, to the sheer comfort of its 12"Wide contoured seats, this aluminum picnic table has it all. Table Width from Bench to Bench: 64"
Table Height from Ground: 30"
Space Between Table Top & Bench: 12.5"
Table frame is a powder-coated utility gray finish. The seats & tops come in multiple colors shown below. 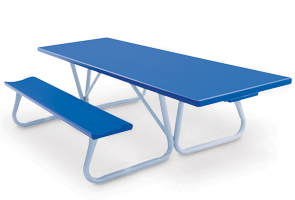 Tops are constructed of individual aluminum boards bolted together and have longitudinal seams. Handicap accessible tables have one overhanging side for wheelchair access. Main frame aluminum tubing is 1.9" outside diameter x .109" thick wall pipe and diagonal braces are 1.5" surface.